The Barefoot International B202 Universal Boom Ultimate Setup is meant for boats with a windshield which ends LESS than 8 inches past the ski pylon. The two B110 boom extensions are for getting kids out of the chine spray. The B107 Height adjuster is optional but is good for lowering or raising the boom. The Barefoot International B202 Driver’s Side Boom Ultimate Setup can be used on EITHER Driver or Passenger side. I personally prefer DRIVER’s side because I drive and teach at the same time and prefer to be as close to the skier as possible. It is OK if you prefer the other side of the boat, it is a personal preference. “The boom is not only for barefooting, it is also the best way to LEARN to get up on skis and boards. 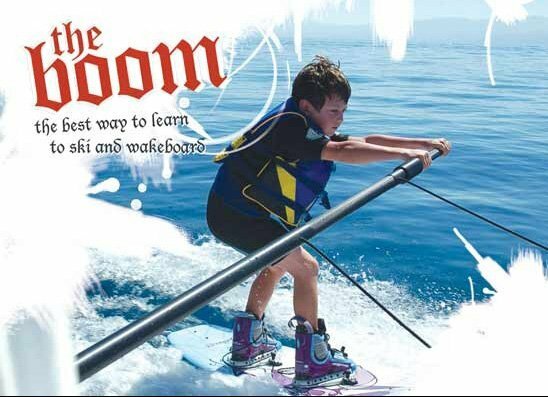 With any of our Barefoot International Booms anyone from 4 years old to 400lbs can learn to get up on skis, boards, surf, or barefooting on the first try. and World’s Strongest Man, Phil Pfister learning to barefoot at 6’8″ and 385lbs!